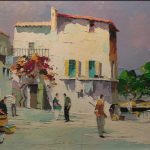 D’Oyly-John was born in South Africa in 1906 . 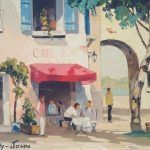 After the Second World War D’Oyly-John was encourage to take up painting. D’Oyly-John soon showed talent and developed his style although retained the naïve quality from his lack of traditional training . D’Oyly-John moved to Cannes and continued to produce successful pieces. His exhibition in Bognor Regis, that was attended by major dealers, was almost sold out with a number of his paintings being acquired by the Queen Mother for the Royal collection. 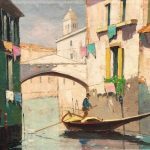 D’Oyly-John continued to travel across Europe in search of new subjects and settled in Brighton for the later part of his life.